I do not have a physical shop / store but you may arrange to visit me to see and try out any drums. I live in Harrogate, North Yorkshire, England. Please CONTACT ME to arrange a visit. Please click on the links above or below to visit the relevant store. I sell Goblet Shaped drums i.e. 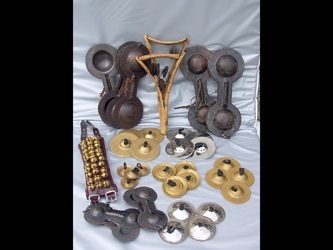 Darabukas, Sombatis etc as well as Frame Drums, Riqs aka Arabic Tambourines and Zills / Sagat aka Finger Cymbals. I have a selection of bags from Egypt with carry handles and shoulder straps. Most drums I sell include a standard soft case. A dull sounding Goblet Shaped Drum can be radically altered by replacing the original drum head with newer models now available. Whether or not you can access a teacher, some extra tuitional material can be invaluable in helping you progress with your playing and I have a few of these items for sale.